With one cutter, users can now joint, mill, round, and mill rounded contours on solid core and solid surface materials. Thanks to its plunge tip, the cutter can also dip, for instance for pocket milling – making it a 5-in-1 solution. 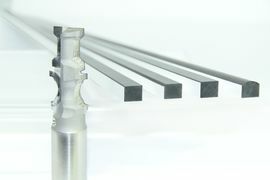 The diverse potential applications spare users from operating multiple individual tools and taking up valuable tool changer places on the CNC machine. For Holz-Handwerk in Nuremberg, LEUCO is presenting a new diamond tipped, flexible shank-type cutter for working with solid core and solid surface materials on CNC machines. With just one cutter, users can now Joint, chamfer, round off, and mill a rounded contour on solid core and solid surface materials. Thanks to its plunge tip, the cutter can also dip, for instance for pocket milling – making it 5-in-1. Chucked in a precision clamping device, it is possible to create chip-free, smooth edge surfaces without grooves. The diamond tips guarantee the longest available edge life with these abrasive materials. The diverse potential applications spare users from operating multiple individual tools and taking up valuable tool changer places on the CNC machine. It’s perfect for anyone processing a wide mix of materials for a broad customer base, or anyone purchasing a cutter who is uncertain which edge shapes their customers will request in the future. LEUCO sees working with customers to find the best, most economic solution as its core mission. That’s why LEUCO will also be showing diamond-tipped cutters at the exhibition for specialized solid core and solid surface materials processors who work with clearly defined plate thicknesses, chamfers, or radii. These can be purchased from the LEUCO stock program or manufactured according to customer desires. In contrast to the new, flexible “multitasking cutter,” LEUCO recommends these tools when standardized tasks need to be milled economically in large quantities.